Alexander Zaitchik of Media Matters has a very funny sendup of the Las Vegas denier fest that is being put on by the Heartland Institute. Given the articles from WUWT over the next week are bound to be nothing more than deadly dull faded denier tripe, being rehashed one more time, the Media Matters article is like a little ray of sunshine peeping through the thick fog of denial. It's also informative. ...The biggest sign the genre is maturing hums with neon. 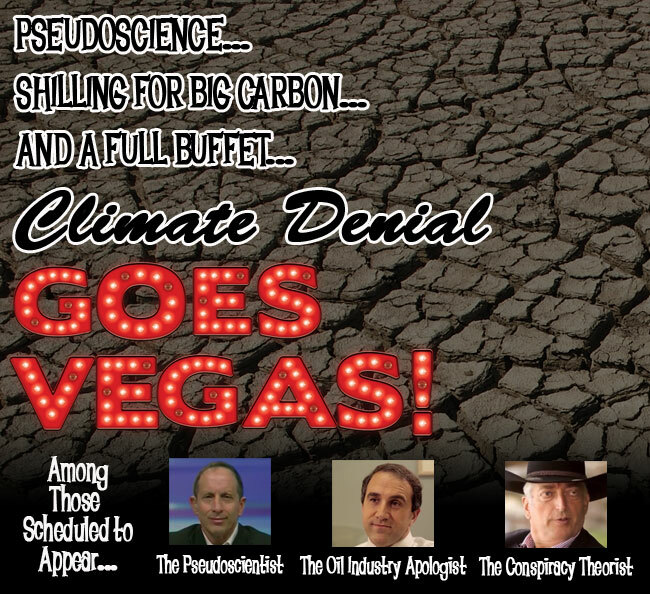 Today, Chicago's Heartland Institute, the kings of unintentional climate-comedy, will hit the Vegas strip with a three-day show at Mandalay Bay Resort and Casino, featuring a chorus line's worth of hilarious climate rejectionists. The line-up will collectively perform the energy-policy equivalent of a Henny Youngman routine: "Take my planet capable of supporting civilization. Please!" The think tank that flacked for Big Tobacco against the science of lung cancer will perform off the same playbook to flack for Big Carbon against the science of greenhouse gases. Tickets to see these self-styled climate researchers and political operatives -- almost none of whom are climate or earth systems scientists and nearly all of them funded at one- or two-degrees remove by oil and coal interests -- run $129, including meals. You can read the full article here at Media Matters. It includes a rundown of the Las Vegas denier fest performers. The Media Matters website does an excellent job of detailing the scientific background in climate science of the 60 or so participants at this Heartland echo chamber party. I did a quick count and discovered that only about 15 (or, one quarter of the participants) have any relevant scientific training and publishing history in climate science, and many of those are either unpublished or publish in a non-peer reviewed journal like E&E. In other words, the number of bone fide scientists at the Heartland event wouldn't even constitute a poorly attended paper session at the annual convention of a scientific organization like AGU or AAAS. Looks like a Rogues Gallery of Pseudo Climate Scientists. It hasn't changed much. See Fig E.1 on p.36 of PDF attached to Fakery 2, as well as pp.50-53. I'll have to update that sometime, but you'll see a lot of familiar names ... HI actually recycles! National Party MP George Christensen has attended the Heartland farce...interesting to know the funding arrangements. His 'presentation' is available online at the ABC. It is best described as predictable rubbish. No doubt this will garner lots of appreciative cover from News Ltd hacks, given that their material and style pervades Christensens cut and paste derision. He attacks Tim Flannery with the decontextualisations and misrepresentations well known here, and Ross Garnaut gets the same treatment. He implies that Garnaut in a certain response to Christensen is contradicted in his own report...but what Christensen has done is quote a bit of Garnaut 2008 at the professor, when it's on the record that Garnaut 2011 was what was tabled at the inquiry. Garnaut 2008 was a preliminary report, and was superseded by a number of updates culminating in 2011. No doubt Garnaut will point this out... it's a sad day when this sort of slipperiness is normalised. Roll up! Roll up! Marvel as @SteveSGoddard's timeline come to life! we've a stripper in a till, what a thrill, what a thrill! we pull Jesus from a hat, get into that, get into that! Roll up! Roll up! Roll up! See the show! Looks like that video url is blocked here. I have tried six times to watch and each time the net connection drops out, with perfect line access before and after each attempt. I run software on a computer monitoring and recording, sort of supper traceroute, with a plot showing total drop outs and periods of high latency. This on a VM connection. Not that I am missing much. Has anyone downloaded the 'climate model' from Jo Nova. I have, and it's not a physical climate model at all. (The fact that it doesn't contain a single physics formula is a hint) It's just ideology on steroids. A compilation of misinformation and misrepresentation. What is it with Nova, Evans, Watt, Monckton wilfully and grossly misrepresenting the science. This totally reprehensible. But I guess it's the cowardly and disgusting tactics they have to resort to. "See NOAA’s PDF, table T1 (on page 14): heat content change for the 0 – 700m layer of the world’s ocean of 15.913 * 10^22 Joules corresponds to a change in mean temperature of 0.168 deg C, so 10^22 Joules in 0-700m of the world’s oceans is 0.168/15.913 = 0.0106 deg C."
Well, "NOAA’s PDF, table T1" turns out to be in the supplementary materials for Levitus et. al. 2009 (a great, succint read by itself, BTW). Indeed, since 1955, Levitus found an increase in mean volume temperature of the 0 - 700m layer of 0.168 deg C.
Now... that *is what it is*: an increase in mean volume temp expressed in deg C. So how in the heck can you divide it by 15.913 x 10^22 joules and arrive at a meaningful number?! I mean, just what *are* the units then? Of course, 0.0106 deg C looks a whole lot less scary to their captive audience of numpties than 0.168 deg C does, so I guess mission accomplished then? Unless I'm missing something. That's always a possibility. I mean... the guy purports to be a rocket scientist, and I'm just a lowly EE. But experience tells me that when you apply only a cursory amount of due diligence to almost anything these people have done, it all tends to unravel in front of your eyes rather quickly. You're completely right. I'm wrapping up my Physical Ocean degree and the author is playing fast and loose with the units hoping nobody notices. Degrees C/Joules is exactly that, a nonsensical number, not degrees C like the author claimed. Basically Levitus calculated the total heat content of that layer by multiplying total mass*del(temp)*specific heat capacity of seawater. The units work out to (joules/kg*c)*kg*c= joules.